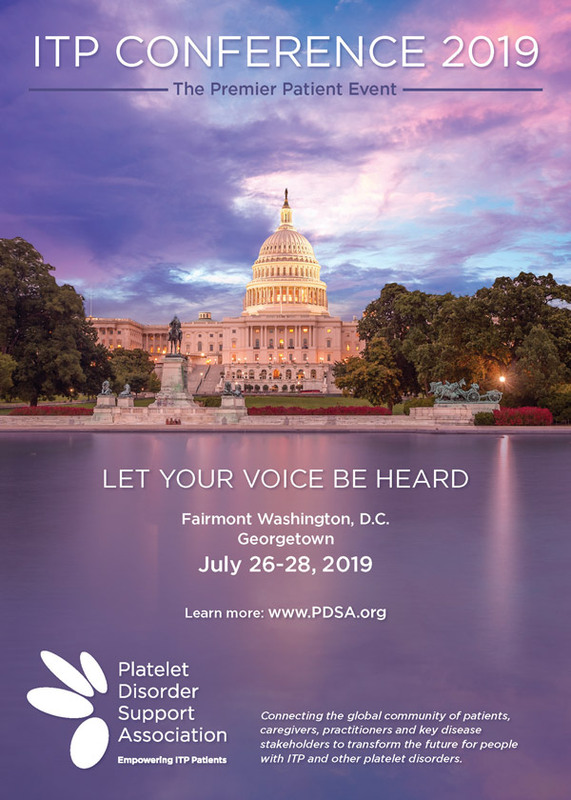 This year, PDSA will host its 19th annual update on immune thrombocytopenia (ITP) for patients, caregivers and the medical community in Washington, DC July 26-28. This year’s patient conference will take place at the Fairmont Washington, DC, Georgetown. Each year the ITP conference provides opportunities to hear the latest information about ITP, meet others who are coping and living with ITP and receive answers to your medical questions. You will also have the opportunity to ask your questions to PDSA’s Medical Advisors, who are some of the most experienced ITP doctors in the world. You don’t want to miss out on this tremendous opportunity to hear and talk with these world-renowned experts. A highlight to the weekend will be the Externally-Led Patient-Focused Drug Development (EL-PFDD) meeting on Friday, July 26, where representatives from the FDA will be on-hand to get patient feedback on current ITP treatments and future drugs in development. You don’t want to miss this important meeting, which will begin at 11:00 AM on Friday, July 26 and run until 4:00 PM. Lunch will be provided and a patient mixer will follow the close of the meeting. In addition to the educational program and social events, our conference will feature several small group sessions to give you an opportunity to get to know other patients and caregivers in an intimate environment. We will also offer programs for children at our Kids Kamp for children ages 5-12. Like last year, this year’s conference will provide a separate track for teens and young adults. You may also download and print the conference registration form. All meeting activities will be held at the Fairmont Washington, DC, Georgetown. Located in Washington’s fashionable West End and adjacent to historic Georgetown, the newly renovated Fairmont Washington, DC welcomes guests in capital style. With a sunlit urban courtyard and soothes the spirit, the Fairmont is the perfect hotel for business or leisure travel. A relaxing visit to the hotel’s fitness center, indoor pool and serene courtyard provide guests with an array of rejuvenating experiences. The Fairmont Washington, DC, Georgetown is 5 miles from Ronald Reagan Washington National Airport (DCA), 26 miles from Washington Dulles International Airport (IAD) and 35 miles from Baltimore-Washington International Thurgood Marshall Airport (BWI). If you plan to stay at the Fairmont Washington, DC, Georgetown, please reserve your room as soon as possible to receive our special conference rate of $149 a night (king or queen/queen), plus tax. This rate is for 2 adults or a family of 4 with children under age 18. Triple and quad occupancy rate is $179.00 per night. This special PDSA rate is also available for conference attendees three days before and three days after the conference. This special rate applies to reservations that are made by July 3, 2019, as long as rooms at the hotel are available. We encourage you to make your hotel reservation early to ensure room availability. Reservations can be made online or by calling 800-441-1414 and referencing the group code Platelet Disorder Support Association. Partial scholarships to attend the ITP Conference are available. Please see the Registration Form for more information. You can return your completed registration form, along with your letter describing your diagnosis, your financial need and the benefit you hope to derive from attending the conference by June 28, 2019. Information can be returned via email at bfoster@pdsa.org, by fax at (844) 270-1277 or via mail to PDSA, 8751 Brecksville Road, Suite 150, Cleveland, OH 44141. If you need to cancel your registration for the Conference, you must submit your request to cancel in writing prior to July 3, 2019. All fees less a $50 administrative charge will be refunded if a written request is received before the July 3rd deadline. After July 3, 2019 no refunds will be issued. If you have any questions or require assistance while completing the registration form, please contact Jody Shy at the PDSA office at (440) 746-9003 or (877) 528-3538 or via email at jshy@pdsa.org. "Thank you so much! As first timers we thoroughly enjoyed the entire weekend and learned so much! The presenters, venue, food, location, exhibits and of course, celebration party at the Rock and Roll Hall of Fame were all amazing! We hope to see you again." – Julie A. "Thank you for giving us the chance to not only speak with medical professionals but with others. It was an amazing weekend!" - Winnifred T.
"I am definitely planning on going to next year's conference. I wish o could have made it this year." - Mandy M.
"The conference was the best! I love seeing old friends and making new ones! I always look forward to it. Caroline Kruse and her staff do a tremendous job!" - Barbara P.
"We had a blast! Thank you so much Platelet Disorder Support Association for planning such an amazing weekend. We learned so much. Thank you, Allison and the rest of the crew in the Kids Kamp for making kids camp so much fun for the littles. Cayden and Cora had a BLAST!" - Jenni K.
The complete video collection from ITP Conference 2018 is available for purchase in The Platelet Store.